In an effort by my parents to improve my skills as a hockey player when I was 15 years old, and most likely to also get me out of the house, they sent me to summer hockey camp. It was quite a wild adventure. Now I should preface this by the fact that I wasn’t an incredible hockey player to begin with. Even though I had been playing since I was about 10, I was just a little bit better than mediocre. I was a heck of a skater; in fact, due to the amount of time I spent skating on a pond in the woods behind my house I could probably skate circles around every other kid in my neighborhood. But to be a great hockey player you have to be able to hit – and hit hard and get hit. And in order to do that you have to be fairly big. While I was tall, I was only about 140 pounds soaking wet. So I got killed in the corners and that wasn’t so good when it came to digging the puck out of the corners so the center could score. Nah. That’s Philadelphia Flyers star and Boston Bruins arch-nemesis Bobby Clarke. I just liked the photo. So this was a summer day camp. Meaning that I didn’t sleep overnight at the camp. I just stayed there during the day, which was enough for me. This was a strange hockey camp. It’s the only hockey camp that I’ve ever seen before or since that had a skating rink where we would practice and play games on some type of slippery hard plastic material. I’m not sure what it was, but it wasn’t ice. My parents must have got a heck of a deal, sending me to a hockey camp with a rink without ice. I swear this today to you. It was some type of synthetic ice which I suppose has the advantage of not having to have those cooling elements that keep it frozen. Now I realize that some of you may think I’m making all of this up, so I searched the World Wide Web and found a video that proved my point. Watch and be amazed and imagine an entire regulation ice rink made of some kind of synthetic plastic. Again, our rink was bigger than that. It was a strange sensation – skating on plastic. And it was a little bit harder to push off on your back foot. But that’s okay we were told. That will make you a stronger skater when you finally skate on ice. Okay, whatever. One thing is for sure. 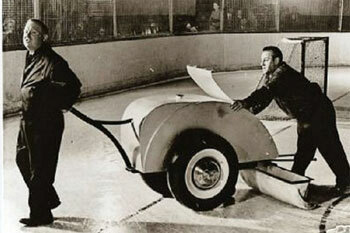 It certainly cut down on the need for a Zamboni. Here’s one they could probably have afforded at this apparent low budget operation. Here’s what they look like today, in case you haven’t been to a game recently. 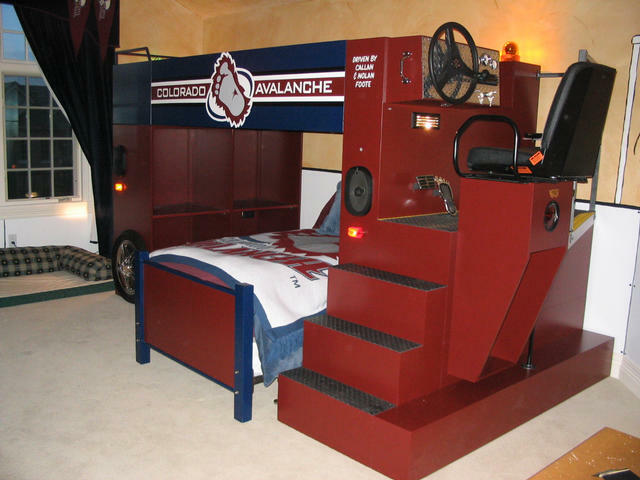 That bed is in case the Zamboni driver has a second or third job and needs a bit of shut eye during the periods. But you’re probably wondering why the title of this blog is “The Runaway Horse.” Well, sit on back little doggies and I’ll tell ya. It seems hockey wasn’t all we did at this camp. I mean you can only play and practice hockey so many hours a day. I remember there was a pond. There were other summertime activities, like baseball or softball and maybe even a bit of soccer. But the highlight for me was that they owned a horse. (Great right. They could afford a horse, but not a damn Zamboni.) But I loved this horse. I can’t remember his name either, so let’s call him….Horse. Fortunately, the horses trainer saw what was happening, noticed the look of sheer horror on my face and said the secret word (all horses have secret words that mean something to them but not to us) which slowed the darn thing down to more of a…well….to a stop. I got off and didn’t ride again for about 10 years. I went on to become a star hockey player, scoring the winning goal in the Stanley Cup Finals and I even let the horse’s real jockey pose for a photo with Lord Stanley’s cup. And if you believe all that I have some synthetic ice that I’d like to sell you. Now that is flat-out funny. Are you sure the horse’s name wasn’t Mr. Ed? That one line, Mike, is funnier than my entire post. Must have been great for business. Too funny. I have never really been horse riding before but it sounds like fun. I can just merely relate to that….